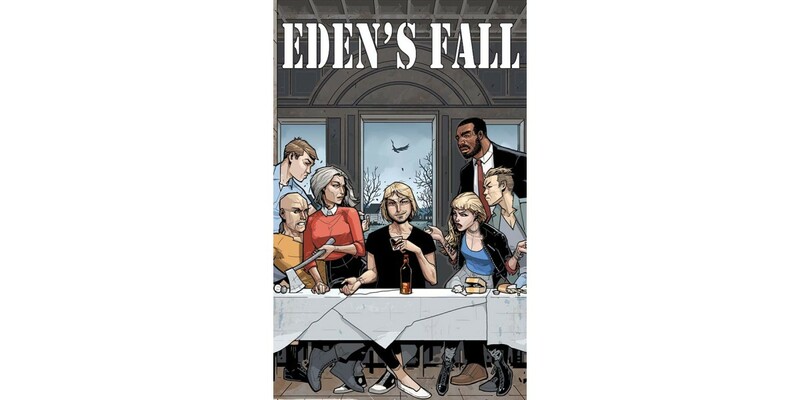 Top Cow/Image is pleased to announce that fan-favorite crossover series, EDEN’S FALL, by Matt Hawkins, Bryan Hill, and Antilio Rojo, will be collected into trade paperback and available this December. It will collect EDEN’S FALL #1-3, THINK TANK #1, POSTAL #1, and THE TITHE #1. In EDEN’S FALL, Top Cow combines three of its most provocative titles (THINK TANK, THE TITHE, and POSTAL) into an unflinching fable of revenge and consequence. FBI Agent James Miller (THE TITHE) follows a sociopath into the off-the-grid town of Eden, Wyoming, on a personal mission of vengeance. The price of this vigilante justice will be paid in blood, and both Eden and James Miller will never be the same. EDEN’S FALL trade paperback (Diamond Code: OCT160658, ISBN: 978-1-5343-0065-1) will hit comic book stores on Wednesday, December 21st and bookstores on Tuesday, December 27th. The final order cutoff for comics retailers is Monday, November 7th. It is also available for pre-order on Amazon, Barnes & Noble, and Indiebound.